What to make of President Massud Barzani’s visit this week to Washington? His Kurdistan Democratic Party (KDP) supporters want to trumpet the occasion as an example of their leader performing on the world stage, negotiating face-to-face with the US president on critical issues such as securing direct military aid for the Peshmarga and independence for Kurdistan. But the truth is that no substantive gains were achieved for the people of Kurdistan. Instead Barzani has treated us to a costly PR exercise – a deception for internal consumption, designed to help prolong his grip on power. The pro-KDP media in the Kurdistan Region is trying hard, almost North-Korea-style, to misrepresent reality. ‘White House supports Kurdish demands’ said ‘Bas News’, which is owned by President Barzani’s son Masrour, who is also chancellor of the Security Council. It claimed that ‘Kurds have green light to declare independence’. The pro-KDP ‘Khabat’ and ‘Hawler’ celebrated Barzani’s apparent big achievement in being ‘received at the White House like the president of a developed country’. 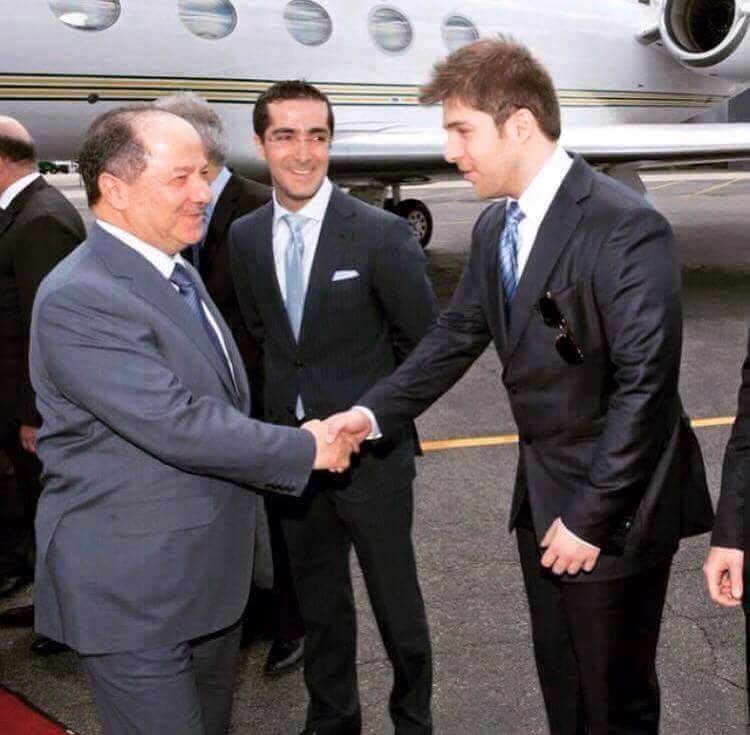 When Barzani arrived in the US he was greeted at the airport, not by a mobilisation of the Kurdish émigré community nor by any senior US officials but rather by his sons and grandsons and two junior US officials. Barzani was not a guest of the White House: his invitation came from the State Department. On Tuesday he did not meet US President Barrack Obama in the Oval Office: he had a White House meeting with US Vice President Joe Biden, and Obama showed up to participate halfway through their discussion. During this meeting Barzani did not raise the issue of independence for Kurdistan and the US President and Vice President reaffirmed their commitment to a united Iraq. Biden rejected Barzani’s call for the US to directly arm the Peshmerga – instead of sending all its weaponry to Baghdad – and yet Barzani still agreed that the Peshmerga will engage fully in the highly risky Mosul operation against ISIS due to take place this summer. What was achieved by the Kurdistan president and his sizeable delegation (which included, as usual, the KRG foreign minister acting as Barzani’s interpreter)? Some misleading headlines. On Wednesday, Barzani delivered a speech to the Atlantic Council – an organisation reportedly with interesting financial links to the Kurdistan Regional Government (KRG) – full of the usual rhetoric and repetition, boasting once again that “independence is coming” but providing no answers to the KRG’s growing problems. He did refer to the terrible atrocities suffered by the Shengal Yazidis, but only to blame this on “local tribes”, even though everyone knows that Barzani’s KDP forces fled the area last summer and left the Yazidis at the mercy of ISIS. The KDP is trying to re-write history (and there are reports of Yazidi refugees being sacked and victimised for speaking the truth about what happened to them), but this will only serve to remind people of a shameful betrayal. As the clock ticks towards the expiration of Barzani’s extended presidential term, the Kurdistan Parliament’s majority of non-KDP MPs should not be fooled by the Washington razzmatazz and they must not waver from their democratic responsibility to renew the presidency and establish a parliamentary system of government. RT: A step at a time. Kurds gained Kirkuk back. Next is Mosul and all Kurdish territories. Believe in Barzanis diplomacy. It’s not the right time for Democracy. There are plans to liberate all parts of Kurdistan. If South declares independence now, it could be invaded any time. Everything cannot be disclosed in open media. Kurds must play their card smart. Neighboring countries are closing monitoring every development in South. In the name of fighting Daash, Kurds are moving forward. Should a war breakout in Iraq between Kurds and Arabs, the US and west will categorically back the Kurds. A secret meeting took place between representatives of Komala and PDKI in Washington D.C. The restive situation of Iranian Kurdistan was the main theme of discussion. Dictator corrupt Barzani is a lair. There is no independence. He is buying time to re-extend his term. This war is all about IS. No more wars. If he means independence, why he has not done so. His father was a legendary. Even members of his won tribe are against him. They would prefer a Sorani to be elected in this upcoming election. Every one is fed up with the tribal system in Kurdistan. What our people wants is living life in dignity and respect freedom. Freedom is NOT a luxury that you want to postpone it for another time. Honestly by all respect to Mala Mostafa I think Kaka Masoud and Mam Jalal have not served our people. Looking at their relatives on all kind of positions and rumors of being millionaires its NOT much that Iran’s tyrants best friends can do or will do for us as a nation. Looking back in the last 35 years I think these two gangs need to stand down if they really want to serve Kurdish people, what I highly doubt! As a Kurdish man by all love to my people I do not like do any step for which these people take credit. Its an unfortunate that their mercenaries are called Peshmerga. Its truly a big blow to Kurdish cause their fighters are called Peshmerga! To those who love power in Kurdistan! ” When the power of love overcomes the love of power the world will know peace”.